Manteo Booksellers provides a summer reading list for the beach and beyond. This week’s summer reading list comes from our friends at Manteo Booksellers in Manteo. 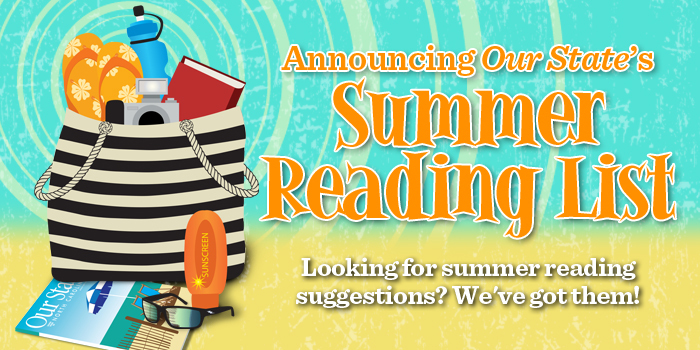 We know Our State fans and friends love to read, and we’re pleased to provide you with book suggestions all summer long! Scroll down for more information about Manteo Booksellers, and leave your own reading list suggestions in the comments section at the end of this page. Tori is the first woman to row solo across the Atlantic Ocean. Besides launching her first attempt right here on the Outer Banks, the book is much more than a rowing story. This is the story of mental, physical, and spiritual limits. It’s an individual story, but also one of friends, family, and relationships. A quirky novel of people drawn together by lightning. Set partly in Chapel Hill and the Outer Banks, Michele begins each chapter with a lightning fact, which fits into the plot of the novel. Touching, surprising, and a great summer read. Jan won the prestigious John Burroughs Medal for nature writing for this book. Wind plays a huge part in the history and mind-set of the world. Whether through disastrous events, such as tornadoes and hurricanes, or through gentle breezes that cool us and bring relief, wind is an integral part of our lives. DeBlieu explores wind throughout the ages: in mythology, exploration, and even the solar winds in the heavens. Full of facts but never boring, Wind is a breeze to read. Donald is a national storytelling champion currently living on Ocracoke Island. Twenty stories of Donald growing up in the southern Appalachians are chronologically arranged to lead the reader through Donald’s early years. Often humorous, always touching, if you can’t see and hear Donald personally, this new book is the next best thing. It’s rare and nice to have an uplifting, encouraging book, and Heaven is For Real is just that. During emergency surgery, 4-year-old Colton Burpo slips from consciousness and enters heaven. The stories he tells about his family on earth and those already dead could only have occurred from his heavenly visit. It’s an amazing story that begins on the brink of disaster and leaves the reader hopeful and happy. Israeli author David Grossman has crafted a slightly mysterious, engaging story filled with people often on the edge of their lives. Set in Jerusalem, and populated with oddball characters both teenage and adult, this is a simple story of a young boy trying to return a dog to its owner and a young girl trying to save her drug-addict brother. Interesting to read if for no other reason than the people and location are so totally foreign to our daily existence, and yet the emotions are so close to home, the story turns out to be more than just a travelogue. Rob Lilwall traveled more than 30,000 miles over three years on one bicycle. During his journey, he traveled to Siberia, South Korea, Japan, China, Indonesia, Australia, India, Afghanistan, Iran, Turkey, and back home to England. The book is a good story of human endurance. And it’s fascinating to read about a wide variety of world geographic areas and their varied cultures. Rosenberg develops novels centered in the middle east, with this one specifically set around Iran and what is currently happening in the Muslim world. The possibility of nuclear war, an Islamic messiah, and the CIA are all part of the plot that twists and turns in this exciting novel. And there’s even a well-done romance mixed in. Rosenberg is a knowledgeable Washington D.C. insider. Teddy Roosevelt was one tough bird. Whether you agree with his politics or not, you will enjoy this fascinating, true story of Roosevelt’s 1913 journey down a previously unexplored tributary to the Amazon River. Roosevelt and his companions display an amazing willingness and ability to survive incredible hardships. Fortunately for mankind, except for space travel, current explorers have hardly been this unprepared. Manteo Booksellers specializes in books about the Outer Banks of coastal North Carolina, including nonfiction, fiction, children’s books, local cookbooks, nature guides, histories, and more. The shop carries books on Outer Banks lighthouses, diving the wrecks in the Graveyard of the Atlantic, Civil War battles fought on the coast, The Lost Colony, and early colonization of America by the English. The collection also includes books about the natural history of the area and field guides to the area’s flora, fauna, and sea life, along with travel guides and books on other topics that reflect the life and times of North Carolina’s barrier islands. The shop stocks Outer Banks folktales, and ghost and pirate stories, as well as photo books and calendars of some of the Outer Banks’ most popular scenes from the heart of downtown Manteo. The shop’s selection of fiction includes books set on the Outer Banks or written by Outer Banks authors. Manteo Booksellers holds many author events — both signings and readings — throughout the year. Manteo Booksellers is a year-round, full-service bookshop.